Have you ever heard of Chicken and Waffles? Served together, as in on the same plate? No? Well, I had never heard of such a meal either until moving to the South. I saw this meal on a handful of menus around town and it was mentioned a few times in conversations, but I never really thought about it. The most common description for this meal is a piece of fried chicken served on top of a buttermilk waffle, then everything is drizzled with maple syrup. It sounded a little odd, but intriguing at the same time. So I had to make this meal just for fun and I thought my kids would get a kick out of the idea of chicken and waffles for dinner. The funny thing was, we all loved it! The waffles were another project altogether. I've read many recipes for pumpkin waffles, which are quite tasty, but since I had some leftover mashed sweet potatoes, and I had always wanted to try a waffle made out of sweet potatoes, the recipe kind of came together on its own. Sweet potatoes + chicken + maple syrup? It was sounding better and better! This was the first time I've used a waffle iron but I'm already in love with it. The waffles had a light airy texture inside and the exterior was nice and crispy. Perfect! In addition to maple syrup we also tried a drizzle of honey on the waffles and it was also delicious, but we all voted in favor of the maple syrup. Although this recipe seems a little strange I do hope you get to try it. The flavors are an amazing combination and the sweet potato waffles are really a unique treat which would even work well for breakfast..lol. So here is my question for you... Have you ever tried Chicken and Waffles? Is it really a Southern meal? Leave me a note below, I'd love to hear what everyone thinks of this somewhat classic dish. Preheat oven to 400 degrees. Spray a baking sheet with cooking spray and set aside. In a large bowl combine the chicken and canola oil (**see note) and stir to evenly coat the chicken. In a second bowl combine the bread crumbs, cheese, salt and pepper. Dip the chicken strips in the bread crumb mixture and place on the prepared baking sheet. Bake 10 minutes, turn, and bake 5 - 8 minutes longer or until the chicken is cooked through. **Note: If you plan on serving the chicken as part of a different meal than the Chicken and Waffles, and you would like the chicken a bit more spicy, add 1/2 teaspoon cayenne pepper or 1 teaspoon Frank's Hot Sauce to the oil and chicken, then proceed with the recipe as above. This is a fast and easy way to make chicken strips for kids without all the processing you get in the store bought chicken nuggets. Use a hand mixer to cream together the butter and sugar. Add the egg yolk and blend, then gradually add the milk, slowly incorporating it into the mixture. Add the salt and nutmeg and blend until smooth. Beat in the flour, sweet potato and baking powder until smooth. In a separate bowl, beat the egg white until you have stiff peaks. Using a spatula, gently fold the egg white into the waffle batter, combining the ingredients without over stirring. 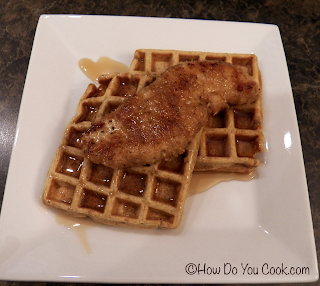 To serve, place two waffles on a plate, top with one chicken strip and drizzle with maple syrup. Enjoy! !